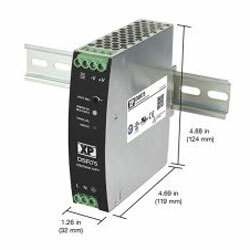 RS Components are offering the XP Power DIN rail power supply, with 24VDC output voltage and 3.2A output current. The device’s ultra slim design is only 32mm wide. The supply provides 150% peak load for three seconds. The ambient operation works from -25C to +70C, with full load at 60C. The device displays high efficiency of Up to 91%. The device provides volt-free contact for DC OK and has selectable parallel operation. The power supply comes with a three year warranty.